Site notes: The yew grows behind a fence ESE of the church. While the yew changes imperceptibly from year to year, the information board has worn out and been replaced. 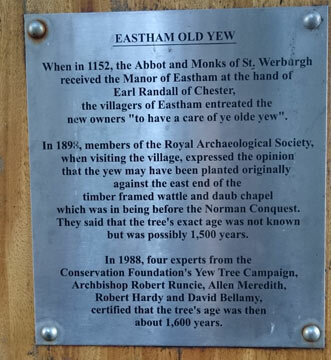 The text is as follows:'When in 1152, the Abbot and Monks of St Werburgh received the Manor of Eastham at the hand of Earl Randall of Chester, the villagers of Eastham entreated the new owners "to have a care of ye olde yew". In 1898, members of the Royal Archaeological Society, when visiting the village, expressed the opinion that the yew may have been planted originally against the east end of the timber framed wattle and daub chapel which was in being before the Norman Conquest. They said that the tree's exact age was not known but was possibly 1,500 years. In 1988, four experts from the Conservation Foundation's Yew Tree Campaign, Archbishop Robert Runcie, Allen Meredith, Robert Hardy and David Bellamy, certified that the tree's age was then about 1,600 years'.